Welcome to the weekend dear readers!! Deepa and I have a fantastic surprise in store for you! We are planning something really awesome for next week for all of you and your friends! This poster gives you an inkling of what's to come, so wait with bated breath, there is a gorgeous, true blue Aalayam style giveaway waiting for you! Now, on to this week's post! For this post, Deepa and I worked together, so you will see corners and floral inspirations from both our homes, and scribbling from both our inkwells...so..here goes! A gorgeous brass accent complements a jewel tone vase - Deepa's home. Have you stopped at the grocery store lately? The first thing you notice is the pretty blooms that are on display both inside and outside the store. The spring season is nature's tribute to life! And there's nothing like fresh flowers to infuse life and zing into your living space! Decorating with fresh flowers is probably one of the oldest and simplest universal home decorating techniques. Whether they are yellow flowers in a purple glass vase that compliment the yellow and purple jute braided pillows or tender coral roses that kiss the blue and white Moroccan vase in a zen bed room, flowers add elegance and glamor to your space! A mood fix for sure - a zen reading nook - Supriya's home! Fresh flowers are an instantaneous color and textural fix not to mention a mood fix! There is something undeniably blissful about a bunch of pretty flowers. Actually, there is something divine about the whole process of buying /picking flowers, cutting them, pairing them with the right vase, arranging them and finding a corner of your home that is perfect for those flowers - it is the simple things that bring you the most joy, after all! A book basket, a lamp and a couch - A Serenity corner from Supriya's home! Flowers are the most versatile decor accessories that blend in seamlessly with any decor style - ethnic Indian or rustic chic or casual country or simple elegance. You never go wrong with fresh flowers! Speaking of rustic chic, look how effortless, the delicate coral roses look hobnobbing in a vintage watering can! Finding ways to reuse, recycle and refurbish jars, cans and containers of interesting shapes and sizes, not only is a green thing to do, it adds that element of drama and interest to any living room, study or bedroom! Flowers are a staple feature for all of our festive tablescapes . Deepa recommends going in for the abundance of a lush bouquet and at other times, settling for the striking form of a single stem. Either way, adding some blooms is a great budget friendly way to create visual interest! Deepa and I both like playing around with patterns, motifs and colors to create different vignettes in sprightly hues and bold patterns. Home decorating is all about creating a space that inspires us to live our best life. Flowers not only add beauty but also a live energy and vitality to the space. Fresh flowers make everyone happy! Pairing floral arrangements with accents that you already own is a simple and easy way to buff up a living space. Look how the dramatic black and white two -toned vignette or the mishmash of random colors and patterns thrown together is adding oomph to the decor! Who said Black is boring! - A two toned vignette from Deepa's home! Men, who are reading this post with your ladies, please remember, the staid tulips, or the cheerful zerbera daisies, the exotic lilies, the cheeky carnations, or even the dainty roses..all are sure fire ways of winning your ladies' affection, over and over again. And a redeeming way to a no girls allowed TV or golf weekend!! Gorgeous tulips add drama to a modern family room - Supriya's home! So, dear readers, we leave you with these floral inspirations for your living space and to brighten your day! 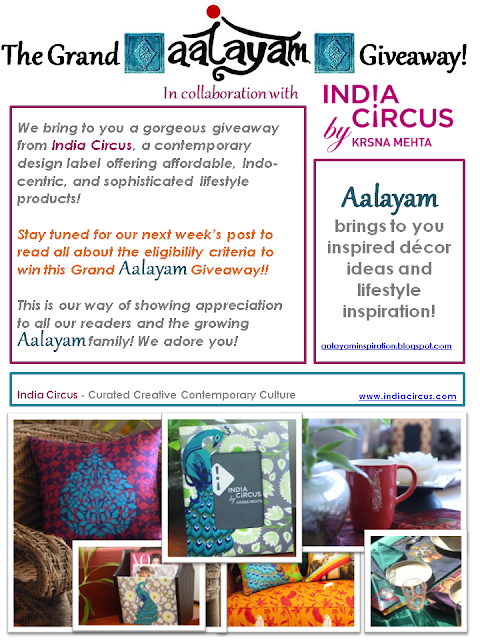 And do not forget about the Grand Aalayam Giveaway next week!!! You deserve to win and we are rooting for you! Thank you for the comment and for visiting us SJ!! This is exciting for us as well!! Simple and yet so pleasing! Div: nothing like the magic of fresh flowers, indeed! Wow!!! u too have azmzing abodes ! loved them to the core. All the images are eye candy Supriya and Deepa...so beautiful. Thank you Nayana and MSD! :) Humbled by the feedback!